Introducing Bang Bang. A thrilling cover band. A dynamic, fresh and fearless four piece outfit whose music is defined by its fusion of classical, jazz, soul, pop and rock music. Driving piano melodies, sophisticated guitar soundscapes and 3 part harmonies bridge the blues-rock, pop-rock and the hard-rock genres offering something for everyone to enjoy. Bang Bang likes to dwell slightly left of centre with a repertoire that slays them on the dance floor. An eclectic mix of classic and contemporary anthems; well loved but seldom heard on the live music scene, get ready for a soaring, cinematic feast of decade-spanning music that will leave you gasping for breath! Bang Bang loves to play and perform and appreciate the appreciative. Suzanne van Gestel – Vocals. Scott Barr – Guitar, Vocals and Keyboards. Jenni Whitty – Keyboards and Vocals. 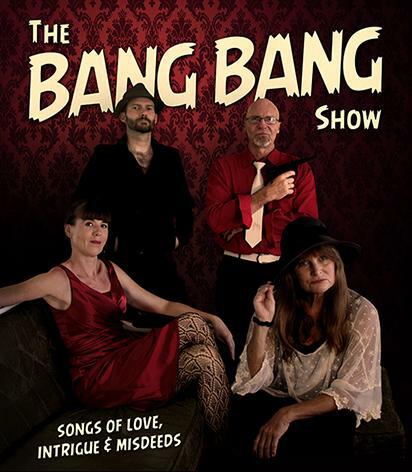 The bands song list includes hits from the 50s, 60s, 70s, 80s, 90s 00s and onwards including artists such as The Rubens, Nick Cave, The White Stripes, The Black Keys, Depeche mode, Blondie, Eurhythmics, Nick Waterhouse, Nina Simone, Steppenwolf, The Rolling Stones, The Doors, The Kinks and The Beatles all delivered in our own unique and darkly dynamic style.